My husband came home one day holding a stick and a leaf. I was very confused. I asked him why he had a stick and a leaf. He said, a bit sheepishly, that he had seen the stick on the way home and thought our dog, Kobi, would enjoy crunching on it (which he did—he loves eating sticks!). I then asked why he had also brought home a leaf. He said it was for me, because he didn’t want me to be left out. I loved that leaf. I gave him a huge hug and thanked him for it. He laughed and asked why I was so happy—it was only a leaf! Except it wasn’t just a leaf—it was his thoughtfulness that made me feel loved. Thoughtfulness is a tricky concept to explain sometimes. It speaks multiple love languages, can cost a lot or a little, and can come naturally or take a lot of work. It can be different to different people, and the lack of it can hurt. Thoughtfulness is a major source of love for me. I don’t want my loved ones to buy presents, say nice words or support me because they feel like they have to. I want them to do so because they love me and think of me. Flowers on a random day—perhaps celebrating a small achievement—mean more to me than flowers for a birthday. A kind word when I’m not expecting it means more than one that feels forced. While I want to be grateful for encouragement and love at all times, the more thoughtful the gift or words, the more they mean to me. My husband loves thoughtful actions. If I took some time to do his share of the housework for a day, he would feel loved. But if I came home one day with flowers for him, he wouldn’t feel so loved (because of his lack of appreciation for flowers). A gift of chocolate, however, would be a different story! There’s a difference between thoughtful gifts and unthoughtful gifts. Thoughtfulness does take time and effort, but it can make people feel deeply loved. I haven’t met anyone who wishes their loved ones were less thoughtful. So how can you be more thoughtful? For some people, thoughtful inspiration happens naturally—they see opportunities to be thoughtful and they put them into action when they can. For others, it might take more deliberate effort. My husband is one of those people who loves to be thoughtful, but sometimes needs extra encouragement or inspiration. It was part of his motivation to develop Noteworthy Cards, to help others like him be more deliberate in thoughtfully loving others. Sometimes all it takes is a prompt to think about why you love someone. 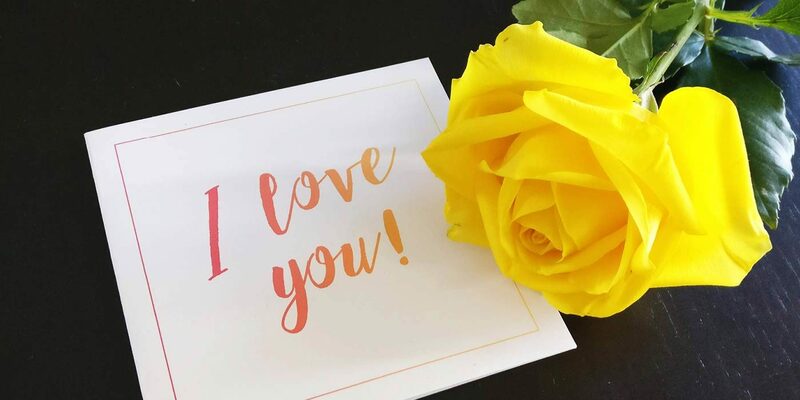 Your partner, children, parents or friends would love receiving one of the cards below in which you can write three thoughtful reasons why you love and appreciate them. Or you might need some reminders to take action and do something to actively love others. Do your loved ones enjoy dates, movies or coffee? The cards below will make their day (assuming you actually take them after giving them the card!). Thoughtfulness is all about knowing a person and speaking love the way they appreciate it. Noteworthy Cards is here to make thoughtfulness a little bit easier. I encourage you to spend some time thinking about how you could be more thoughtful to those around you! Steph is a Blogger for Noteworthy Cards. It was through her encouragement and support that this social enterprise came into existence. Steph loves to give and receive written notes and gifts, and she greatly values encouragement and thoughtfulness. I loved reading Steph’s comments in thoughtfulness.